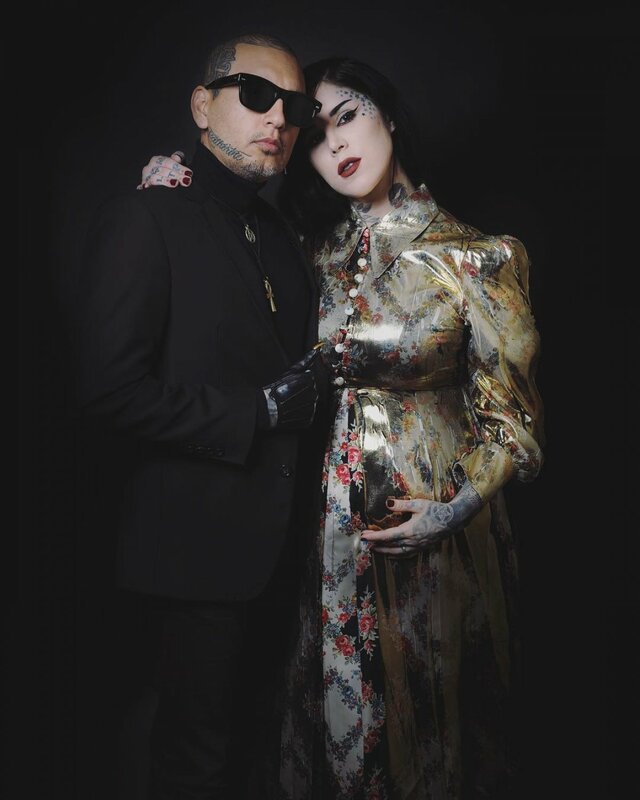 Kat Von D and husband Leafar Seyer may be newlyweds, but they already have a baby boy on the way! The former LA Ink star announced Tuesday on Instagram she's expecting her first child with her husband of three months. "It's a boy," Kat, 36, captioned a photo the 42-year-old Prayers singer and herself. In the picture, Kat was wearing a button down dress and sweetly cradling her baby bump. Kat's pregnancy may come as a surprise to her fans, as she has publicly admitted before she doesn't want children. In a December 2017 interview with Dr. Drew Pinsky, the tattoo artist said, "No children for me. The funny thing is that I've known since I was 7 years old that I was never going to have kids," according to Us Weekly. "I always imagined myself as this worldly, traveling, gypsy lady," she added. "I love children, kids love me, but I think I'd make a really good buddy. I don't know if I'd be a bad mom, but it's not what I want. I don't want to put my body through it." Kat and Leafar got married on February 21, just one short week after getting engaged. "Today I married my soul's mate, my mind's win, my best friend," Kat wrote alongside a photo of the couple's rings on social media. Romance rumors reportedly sparked in December 2015, when Kat and Leafar began sharing photos with each other on Instagram. Kat was previously married to fellow tattoo artist Oliver Peck from 2003 to 2007. Kat got engaged twice to biker and reality TV star Jesse James in 2011, but they split for good in September of that year. Kat later accepted a marriage proposal from Canadian music producer Joel Zimmerman, known as DJ Deadmau5, in 2012. However, Kat and Joel broke up in 2013. LA Ink premiered in 2007 on TLC and aired for four seasons. Kat -- also who appeared on two seasons of Miami Ink -- launched her cosmetics line in 2008 and then her clothing line in 2011.